Sure, coffee grounds can be useful around the house, but what about tea? Better yet, what about used tea bags? Save money by using tea and leftover tea bags to clean and deodorize your home. You can even use tea to dye your hair naturally. Tea lovers: here are nine awesome ways to reuse your tea bags. Save those tea bags for your potted plants. Tea is organic matter that can improve the structure of your soil. It increases soil drainage and helps aerate plant roots. Additionally, it helps the soil retain moisture and nutrients. Because tea’s nitrogen content is high (4.15 percent) it is also an excellent source of nutrients for your plants, gradually releasing nutrients. 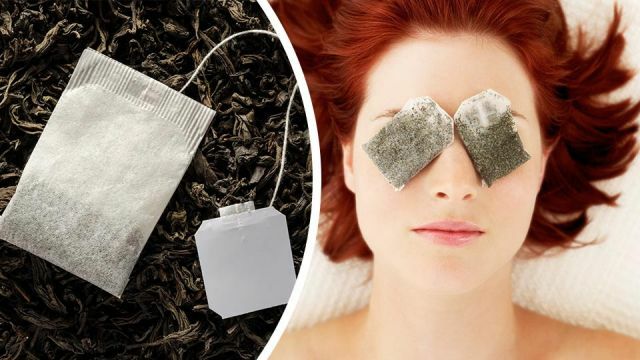 We’ve all heard the old wives tale about using tea bags on our eyes to reduce puffiness and dark circles. The trick of course is to use caffeinated tea, and in particular, black tea. Here’s why this actually works: The skin around the eyes is the thinnest skin on the body. When overtired, or you’ve overindulged in salty processed foods, the eyes puff and blood vessels show through the skin, causing a swollen and dark appearance. A study published in the Journal of Applied Pharmaceutical Science found that caffeine in tea temporarily tightens the skin around your eyes by drawing out excess water. That’s why so many expensive eye serums claim to reduce puffiness — because of the caffeine in the product. Additionally, tannins in tea are thought to fight inflammation. But in reality, the study found that the cool compress of the bag itself provides the biggest benefit by slowing blood flow to the area, thus reducing swelling. So, after dunking your tea, allow the tea bags to cool. Better yet, place them in the fridge to chill for about 20 minutes. Now it’s your turn to chill. Lay back, close your eyes and place the tea bags on your puffy eyes, and stay that way for about 15 to 20 minutes. Used tea is also great for removing those lingering odors in your home. A study published in the Journal of Wood found that when used tea leaves were added to prepared composite paper, it had excellent deodorizing ability. It worked to eliminate odors such as ammonia and trimethylamine gases. In fact, paper samples containing used oolong tea leaves and black tea leaves significantly reduced ammonia concentration. The excellent deodorizing ability of the paper is attributed to the chemical reaction that happens between odor and the catechins found in tea leaves. Additionally, paper containing green tea leaves was also found to have increased antibacterial activity against Staphylococcus aureus. That’s pretty exciting! So, go ahead and mix dried used tea leaves into kitty litter, or drop a few dry used tea bags in the bottom of your trash bins to neutralize odor. You can even store pre-brewed tea bags in the refrigerator to keep odors at bay. Use tea to deodorize your hands after handling fish, garlic or onions. Simply scrub your hands with the tea from a used teabag. Not only will your hands be clean and fresh, they will also be exfoliated. Hey, there’s nothing stopping you from using it on your feet too! Additionally, you can place a peppermint tea bag in each shoe to keep them fresh. Black tea works to tenderize even the toughest cuts of meat. Simply place two tea bags in a pot of warm (not boiling) water and steep for five minutes. Remove the bags and add 1/2 cup raw honey until it dissolves. Set tea aside. Season three pounds of meat with salt, pepper, onion and garlic powder and place it in a Dutch oven. Preheat your oven to 325 degrees Fahrenheit and pour the liquid over the seasoned meat. Cook until the meat is fork tender — about 90 minutes. This may seem counter-productive, but hear me out. You can use pre-brewed green tea to clean and deodorize your carpets. Store your used tea bags in the refrigerator in a cup of water to keep them from getting moldy until you have enough to cover the carpet area. Then empty the tea bags on a paper towel, allowing them dry until they are still slightly damp, but not wet. Sprinkle the loose tea over your carpet until it’s totally dry. Allow the tea to sit for about ten minutes, then vacuum them up. Apply a few damp and cooled tea bags to sunburned skin to relieve the sting. Cooled tea bags are also ideal for minor burns. However, if you have a sunburn on your entire body, place a few tea bags in cool bath water and soak your skin. Give your mirrors a streak-free shine the next time you brew yourself a cup of tea. Simply take the damp, cooled tea bag and rub mirror surfaces. Now use a clean dry cloth to buff the mirror for a sparkly, streak-free shine. Forget chemically-laden hair dyes. Turn your gray hair dark again with black tea. Black tea can reach a dark brown and even black color, but you may need to repeat the process to achieve your desired color. Boil one cup of water in a saucepan. Add three bags of tea to the water and allow it to steep. Add rosemary (or sage) and allow it to sit for 24 hours. Strain the brew and add the tea into a spray bottle for easier application. Put on a pair of plastic gloves to protect your hands and towel on your shoulder to protect clothing. Saturate your hair thoroughly with the tea solution. Blot your hair with a towel, but don’t rinse it out. Style your hair as per usual. The next time you shower, rinse hair with cool water. There you have it: nine ways to use tea and leftover tea bags. A little ingenuity can save you a lot of money!